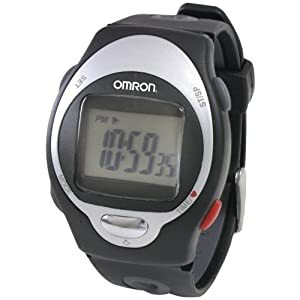 Omron HR-100CN is a heart rate monitor with chest strap from Omron. It is accurate, reasonably priced and simple to use. Omron is famous for excellent quality products with amazing feature and cost effectiveness. HR-100 CN contains features such as easy to program monitor, zone alerts, and water resistance. These features are more than enough for most of the workouts. The highlight of this heart rate monitor is you can program your zone to achieve optimal health. The monitor comes with a chest strap and the wrist unit and is very accurate. I am not saying that the other models that have everything built-in in wrist such as Omron HR-210 unit are not accurate. However, the heart rate monitors with chest strap are considered more accurate. In HR-100CN, the chest transmitter sends the data to the receiver up to the distance of 98 feet. The chest strap needs to be wet to get the accurate readings. Continuous Heart Rate Reading: It provides continuous heart rate readings. You do not need to touch any button to get the present value. This feature helps you to focus on your workout. Data Transfer: It display readings on gym equipments even without you touching the sensor. Comfort for Chest Strap: It has an elastic chest strap. Howeve, a lot of users are not happy with the chest strap, according to them it is tight. The wrist unit is ventilated and comfortable to wear. While swimming the chest strap tends to loosen up thus might be a good idea to make them more tight during swimming. Programmable Zone: For any workout or weight management program, you need to know target training zones. HR-100CN helps you to program your target zones and prompt you when you are out of the targeted zone. If you want to work below the target zone, you need to set it so that the receiver do not beep. Backlight: It has backlight feature, you can view the readings in dark or in dim light. Watch with Time and Alarm: It display time and date like a normal watch. You can set audible alarms. Battery: It gives low battery alerts. The battery is user Replaceable. It is a very handy feature. You need not send device to manufacturer for such a small thing. Water Resistance: Hr-100CN is water resistant for 98 feet. The chest strap is splash proof. Stopwatch Feature: The monitor features a stopwatch, that alerts you when you are out of targeted heart rate zone. The features and price are directly proportionate. If you want other features such as pedometer or averaging features, then better look for another model such as Omron hr-310. Another great choice would be Polar FT1, FT4 or FT7. It is a very basic model that allows you to set target zones. It does not have data transfer option, no graphic representation, does not have pedometer or GPS. Those features are generally captured in high end heart rate monitors, one good choice would be Polar FT40, FT60 and FT80 series. However, if you are not looking for great features and are happy with the basic heart rate monitor, then it is worth looking. It is decently priced, you need not shell out more moola.